Earlier today, S and I visited the Ann Hamilton exhibit at the Park Avenue Armory. Titled "the event of a thread", the exhibit mainly comprised of a large diaphanous white curtain in the middle of the very impressive, expansive space. The white fabric rises and falls continously, seemingly due to a draught in the enclosed space but in fact through a convoluted yet intricate system of pulleys and ropes powered by a few dozen swings that visitors sit and play on. Talk about bringing out the kid in us! 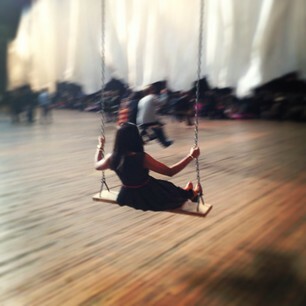 While Ms. Hamilton's motivation behind the installation is rather high brow (read here), I love participatory art and couldn't get enough of the swings especially whilst trying to work out which part of the curtain I was manipulating as I swung back and forth. This was one heck of a spot for quiet contemplation and considering the time of year, some decent resolution-making. It was mesmerising the way the fabric glided and floated - this alone was worth the admission. Merry merry merry Christmas everyone! As a non-Christian household and our immediate families thousands of miles away, we've established a few New York City traditions of our own to usher in this festive day. We start with the night before Christmas, which is the only time of year that Gramercy Park is open to the public, and even then, only for a single hour. Like last year, we braved the frigid cold to carol in the Park, only this year we hung back from the crowds; to sing, cuddle and reminisce on "our" bench instead. The memories we have of this Park are so precious that I won't deny how rough it felt knowing we wouldn't be able to enter this space again for another year. Food solves most troubles so we crossed the street to Maialino and ate and drank ourselves very happy. Christmas Day for us means a visit to the holiday windows and displays around town. Here are some of my favourites. Bergdorf Goodman - while not as elaborate as last years, the 1920s-themed windows are the best of the lot. This particular display was my favourite. Seriously, white peacocks?! And then we made like Jews and had chinese. Hope your day was as festive as mine! Ours started off with usual date-night-Friday, our first one since getting back from travels. I wore this festive DVF dress (I paid pittance for it at the recent sample sale so I suggest waiting for a markdown). Looser than her regular wrap dresses, it was perfect for a hearty winter meal at Barbuto followed by some serious cocktails at Pouring Ribbons. Really serious. The drinks menu contained a graph which categorised cocktails in ranges of "refreshing" to "spiritous"on one axis; "comforting" to "adventurous" on the other - making it a breeze to order drinks I was in the mood for. Suffice to say, it was a GREAT night which resulted in a luxurious sleep-in on Saturday. We had two pressing matters to attend to that day - the first: engagement ring shopping! On recommendation, we met with a dealer in the Diamond District and a few hours later, we decided on the one! My patience will still be put to the test though, as I wait the month it will take to be custom-made. The 2nd pressing matter: coffee and cake with darling Dea - who was lovelier in person. In my sparkliest top, Thea and I took the birthday girl out for cupcakes and probably talked her ears off! I digress a little but blogs do make the world a smaller place and I am thankful for the friendships I've made and the bonds I've built through this tiny website of mine. On Sunday, I got well into the Christmas spirit and so, we headed out to Brooklyn to check out the seasonal holiday flea. Truth be told, there was probably more spirit in my tree-less apartment. We were home well within the hour, where I promptly put on some Rat Pack carols. A little bit of Sinatra later and all was well with the world. Rosegold Stripes Dress layered underneath sweater, bangles from Cartier, Sydney Paddington market and Hermes, Sally Hensen Salon Effects in Check Please! This is truly a wonderful time of year and I hope your weekend was as good as mine. Here's wishing everyone happy happy holidays! Y'all must all be used to these travel-related absences by now but I would like to announce I am now back in the fine city of New York after a wonderful time in Asia. Cue the fireworks, huzzah! This trip wrapped up my travel for 2012 and boy, it sure ended with a bang, otherwise known as continous high fever that knocked me off my feet followed by jetlag that didn't let up for over a week. A WEEK! I am clearly no longer the spring chicken I think I am. Taipei reminded me very much of Seoul with one clear advantage - I don't get to bust out the Mandarin much in New York and it was great to travel to a non-English-speaking country and be able to read and speak the language. I left the itinerary to my dearest friend and current TPE local, HW, whom I most recently traveled with to Biarritz and San Sebastian. Girlfriend knows me to a tee - so it came as no surprise that everything she planned for me involved some form of eating. Think of the guac you could make with these GIANT avocadoes! Stinky tofu - not the faint-hearted. I managed 3 pieces so I call that a VICTORY! The next day started with more chow. I now believe there is only one place and one place alone to have breakfast in Taipei: at Fu Hang Dou Jiang 阜杭豆漿. Located on the second floor, the lines (all locals no less) went down the stairs and snaked around the block. This was one time I thanked my NYC training of waiting forever for food - if there is a line, it must be good! You Tiao twice has long as I the ones in Malaysia/ New York! Fu Hang, which I am told has been around since the 1950s, is famous for traditional Taiwanese breakfast eats. Since most dishes were on the smaller side, we ordered practically everything on the menu - from sweet and savoury soy milk dishes to Taiwanese bread rolls - and promptly licked our plates clean. You would think we had starved ourselves the night before. Fueled up, we squeezed in a visit to the Chiang Kai Shek Memorial before my flight. He had great taste in cars. Not shown, his other Cadillac! This was a memorial hall, hence set up to portray CKS in nothing but a positive light. Naturally, there wasn't much on his dictatorial-like rule of Taiwan, apart from pictures of various diplomatic visitors and displays of his affinity for the finer things in life. Luckily my disappointment was satiated by plenty of pictures of the perfectly put-together Mrs. CKS aka Soong May-Ling. I remember watching The Soong Sisters growing up - set in pre-modern China, the movie dramatised the lives of three sisters who, as the plot set out, married influential men in the then-burgeoning nation, either for "love of country, love of power or love of money". Great movie. Maggie Cheung was in it too. Must rewatch. So there you have it - my 24 hours in Taiwan. Next up, the Fragrant Harbour!